Cold Temperatures Can Mean Survival of the Fattest For Your Backyard Birds! The winter cold is upon us! For humans that means adding layers of clothing...lots of layers for some of us. But what does it mean for our feeder birds? Well, it means eating foods high in fat and lots of it! You've probably noticed with the dip in temperatures your feeder activity has increased. Birds who winter in cold climates like ours can loose up to 70-75% of their body fat overnight as they burn the fuel to stay warm. They’ll need to eat lots of fatty foods before nightfall and lots more when they wake in the morning. Birds such as tiny Chickadees and Titmice can actually eat 20 times more food in cold weather than they do in warm weather. Peanuts. Peanuts in the shell, peanut chips and even peanut butter (always salt free of course) are a great source of fat for birds. 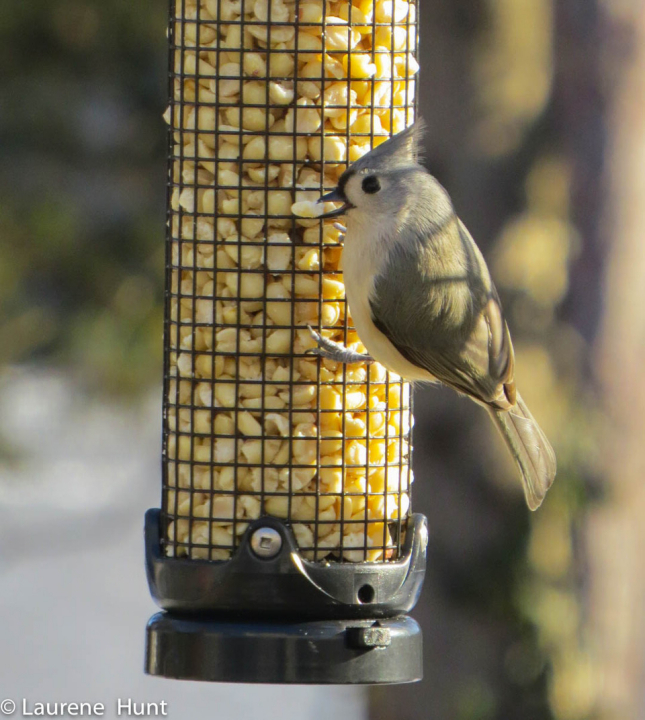 Birds especially drawn to peanuts include Blue Jays, Nuthatches, Titmice, Chickadees, Carolina Wrens and Woodpeckers. Many birds are also drawn to tree nuts such as pecans, almonds, walnuts, and cashews. These tree nuts, as well as peanuts are found in several of our seed blends and seed cylinders. We also offer peanuts in the shell and out. Suet. Suet is a high-fat super food for birds! Even birds whom eat a warm-weather diet of mostly insects and vegetation change their diet to foods high in fat in colder months. Some of the birds you're likely to attract with suet include Woodpeckers, Chickadees, Nuthatches, Carolina Wrens and Titmice. You might also be surprised to learn that Bluebirds, some Warblers, Northern Mockingbirds and even American Robins and Cardinals eat suet. Our Simply Suet is a pure suet product with a 94% fat content and is a very desirable high-energy food. We also offer suet blends with peanuts, fruit and insects to attract nut, fruit and insect-eating birds. Here at the store you will find many ways to offer your birds suet: suet cakes, suet cylinders, suet plugs AND...Bark Butter in a Tub, Bark Butter Bits and Bark Butter Plugs. Safflower and Sunflower seeds are also high in fat and provide superior nutrition for birds all year-round. So consider offering high-fat foods at your feeders as the cold weather sets in. Cold temperatures really can mean the survival of the fattest for your birds!